Badrinath temple, sometimes called Badrinarayan temple, sits on the Alaknanda river, in the hill town of Badrinath in Uttarakhand state in India. Widely considered one of the holiest Hindu temples, the temple has been dedicated to Lord Vishnu. The temple and town number among the four Char Dham pilgrimage sites as well as one of the 108 Divya Desams, holy shrines for Vaishnavites. The temple opens only six months every year (between the end of April and the beginning of November), due to extreme weather conditions in the Himalayan region. Devotees worship several murtis in the temple, the most important a one meter tall statue of Vishnu as Lord Badrinarayan made of black Saligram stone. Many Hindus consider the statue one of eight swayam vyakta keshtras, or self-manifested statues of Vishnu. The murti depicts Vishnu sitting in meditative posture, rather than His far more typical reclining pose. In November each year, when the town of Badrinath closes, devotees move the image to nearby Jyotirmath. Located in the in the Nanda Devi Biosphere Reserve of the Himalayan mountains, the temple benefits from the grandeur of that majestic mountain range. Adi Shankara, the founder of Advaita Vedanta around 800 C.E., designated the site as a holy pilgrimage site. Badrinath, a Hindu holy town and a nagar panchayat in Chamoli district in the state of Uttarakhand, India, constitutes the most important of the four sites in India's Char Dham pilgrimage. Located in the Garhwal hills, on the banks of the Alaknanda River, at an elevation of 3133 m, the town lies between the Nar and Narayana mountain ranges and in the shadow of Nilkantha peak (6,560m). Situated 301 km north of Rishikesh, travelers ride 233 km by road from Badrinath to Gaurikund (near Kedarnath). Established as a major pilgrimage site by Adi Shankara in the ninth century, Badrinath's popularity has increased significantly in recent years. An estimated 600,000 pilgrims visited during the 2006 season, compared to 90,676 in 1961. The temple in Badrinath serves as a sacred pilgrimage site for Vaishnavites. Badrinath has been mentioned as a holy place in scriptures and legends for thousands of years. According to the Srimad Bhagavatam, "There in Badrikashram the Personality of Godhead (Vishnu), in his incarnation as the sages Nara and Narayana, had been undergoing great penance since time immemorial for the welfare of all living entities." Badri refers to a berry that grew abundantly in the area, and nath refers to Vishnu. In the Sanskrit, Badri means the Indian Jujube tree, which has an edible berry. Some scriptures refer to Jujube trees as abundant in Badrinath. Legend has it that the Goddess Lakshmi took the form of the berries to provide sustenance to Lord Vishnu during his long penance in the harsh Himalayan climate. Tapt Kund hot springs next to Badrinath Temple, enclosed inside bath house. The temple stands approximately 50 ft (15 meters) tall with a small cupola on top, covered with a gold gilt roof. The facade, built of stone, has arched windows. A broad stairway leads up to a tall arched gateway, which serves as the main entrance. The architecture resembles a Buddhist vihara (temple), with the brightly painted facade also more typical of Buddhist temples. Just inside stands the mandapa, a large pillared hall that leads to the garbha grha, or main shrine area. Intricate carvings cover the walls and pillars of the mandapa. The main shrine area houses the black stone image of Lord Badrinarayan, sitting under a gold canopy, beneath a Badri Tree. Fifteen additional murtis have been placed around the temple for worship, including murtis of Nara & Narayana, Narasimha (the fourth incarnation of Vishnu), Lakshmi, Narada, Ganesha, Uddhava, Kubera, Garuda (the vehicle of Lord Narayan), and Navadurga. The typical prasad offered at Badrinath temple includes hard sugar candy, Pongal, Tulsi, and dry fruits. 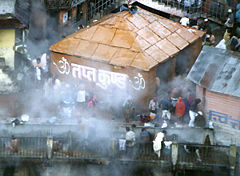 The Tapt Kund hot sulphur springs lay just below the temple. Reputed as medicinal, many pilgrims consider bathing in the springs before visiting the temple a requirement. The springs have a year-round temperature of 45°C. Religious texts as far back as the Vedic period mention Badrinath. Some accounts claim that the temple had been built on a former Buddhist temple site. One legend explains the reason that Vishnu sits in padmasana, rather than reclining. According to the story, a sage who saw Vishnu's consort Lakshmi massaging his feet chastised Vishnu. Vishnu went to Badrinath to perform austerity, meditating for a long time in padmasana. To this day, the area around Badrinath attracts yogis who come for meditation and seclusion. Another legend relates that Shiva and Parvati performed tapas in Badrinath. Vishnu came in disguise as a small boy, crying loudly and disturbing them. Parvati asked the reason for his crying and he replied that he wanted Badrinath for meditation. Shiva and Parvati discovered Lord Narayan in disguise. They then left Badrinath and moved to Kedarnath. According to the Srimad Bhagavatam, "There in Badrikashram the Personality of Godhead (Vishnu), in his incarnation as the sages Nara and Narayana, had been undergoing great penance since time immemorial for the welfare of all living entities." The Skanda Purana states that “There are several sacred shrines in heaven, on earth, and in hell; but there is no shrine like Badrinath.” The area around Badrinath was also celebrated in Padma Purana as abounding in spiritual treasures. Adi Shankara established Badrinath as a pilgrimage site in the ninth century. Shankara discovered the image of Badrinarayan in the Alaknanda River and enshrined it in a cave near the Tapt Kund hot springs. In the sixteenth century, the king of Garhwal moved the murti to the present temple. The temple has undergone several major renovations, due to age and damage by avalanche. In the seventeenth century, the kings of Garhwal expanded the temple. After significant damage in the great 1803 Himalayan earthquake, the King of Jaipur rebuilt it. Although Badrinath sits in the far north of India, the head priest (or Rawalat) traditionally comes from the Nambudiri Brahmin class from the far south of India in Kerala. Adi Shankara, a Malayali, began that tradition. Dimripundits, belonging to Village Dimmer of Garhwal, assist the Rawal. Badrinath represents one of the few temples in North India which follows the ancient Tantra-Vidhi of Shrauta tradition more common in southern India. The Badrinath temple numbers among five related shrines called Panch Badri dedicated to worship of Lord Vishnu. 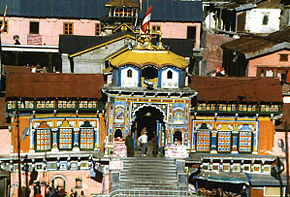 Vishal Badri: Badrinath Temple in Badrinath. Yogadhyan Badri: located at Pandukeshwar, has an image of Badrinath in meditative posture. Legend has it that King Pandu installed a statue here named Yogadhyan Badri. Bhavishya Badri: 17 km from Jyotirmath at Subain. Legend says that when evil rises in the world, Badrinath will become inaccessible and Lord Badrinath will appear at the Bhavishya Badri temple. Thus the future, or Bhavishya Badri. Vridh Badri: Seven km from Jyotirmath in Animath. Vridh Badri means 'Old Badri.' Legend says the Badrinath image originally had been worshiped here, before being enshrined at the current Badrinath. Adi Badri: 17 km from Karnaprayag. A temple complex consisting of sixteen small temples with intricate carvings houses a three foot black stone statue of Lord Vishnu. ↑ 1.0 1.1 1.2 1.3 1.4 Subhadra Sen Gupta, Badrinath and Kedarnath, the dhaams in the Himalayas, Chaar dhaam series (New Delhi: Rupa & Co., 2002). ↑ The Hindu newspaper, November 17, 2006. ↑ A. C. Bhaktivedanta Swami Prabhupāda and Hridayananda Goswami, Śrīmad-Bhāgavatam: with a short life sketch of Lord Śrī Caitanya Mahāprabhu, the ideal preacher of Bhāgavata-dharma, and the original Sanskrit text, its roman transliteration, synonyms, translation and elaborate purports (New York: Bhaktivedanta Book Trust, 1972), 3.4.22. ↑ Indian Jujube Retrieved June 24, 2008. ↑ Uttaranchal Developing on Shaky Ground. Boloji.com. Retrieved October 5, 2007. ↑ Sunita Pant Bansal, Hindu Gods and Goddesses (Spb Enterprises Pvt Ltd, June 2005, ISBN 978-8187967729). Saili, Ganesh. 1996. C̄hār Dhām̄: home of the Gods. India: Indus. ISBN 9788172232245. Sen Gupta, Subhadra. 2002. Badrinath and Kedarnath, the dhaams in the Himalayas. Chaar dhaam series. New Delhi: Rupa & Co. ISBN 9788171676170. Venkatraman, G. R. 1988. Chār dhām yātra = Ecstatic flight into Himalayas. Bombay: Bharatiya Vidya Bhavan. OCLC 20265368. This page was last modified on 6 May 2016, at 20:38.